Sharon Love spoke to Melrose High School students about dating violence. If she had known her daughter was at risk, Sharon Love said, she would have removed her from school. She would have done anything to keep University of Virginia student Yeardley Love safe from the ex-boyfriend who barged into her room and beat her to death. George W. Huguely was sentenced to 23 years in prison after he was convicted of second-degree murder. Prosecutors charged he entered Love’s bedroom on May 3, 2010, in a drunken rage. Both Huguely, 25, and Love, 22, were lacrosse players at UVA. 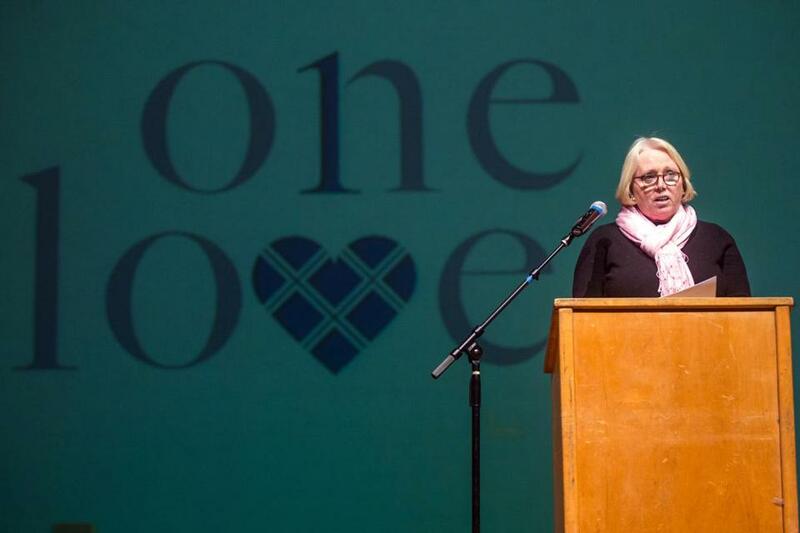 In an effort to prevent violence in other young relationships, Sharon Love and Yeardley’s cousin, Sharon Robinson, leaders of the One Love Foundation , spoke to Melrose High School students last Thursday. Initiated by Melrose Alliance Against Violence and funded by a federal grant, the presentation was part of an initiative launched to teach students about abusive relationships. The Melrose Student Action Board is helping provide classmates with evidence-based lessons about relationship violence. During two assemblies, Love and Robinson took turns talking about Yeardley: her personality, her passion for school and lacrosse, and the circumstances that led to her death just weeks before she was supposed to graduate. Students were silent as the women shared their thoughts and presented a video clip and public service announcement promoting the app they helped develop. The app, available on iPhones and Android devices, is a diagnostic tool that indicates the level of risk in a relationship based on 20 questions that a domestic violence counselor might ask. “My goal is to protect each and every one of you,” Sharon Love told the students. During the assemblies, a video was projected that showed Melrose students and faculty holding up signs, giving their personal ideas on what “Love is” and what “Love isn’t.” Afterward, students and Student Action Board members Alyssa Abbot and Lilah Drafts-Johnson sang Sugarland’s “Stand Up,” which earned a mid-song standing ovation in the second assembly. Abbot said that she was already aware of the dangers, but the personal stories hit home. Another board member, Zeke Vainer, 18, stressed the importance of teaching students to recognize abuse.